(Disclaimer: This is NOT the original book.) 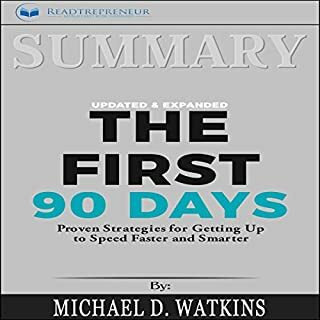 The First 90 Days, Updated and Expanded acts as a guide to help you avoid feeling overwhelmed during a transition. Missteps at the start of your role transition can be detrimental to your career, and learning how to act in each scenario will help you secure early and much-needed wins to accelerate your professional growth. Transitions are tough but not impossible to conquer, and with this book you will know exactly how to tame the beast and excel in your organization. I had read the physical book and then was on a job interview months later where they wanted to see from me a 30, 60, 90 day plan. I couldn’t remember all the highlights from the book and didn’t have access Tony notes over the book. This is where I purchased this audio summary of the book and was once again right back on track. This book did a great job of summarizing the physical book. I look forward to digging into the web site it gives to receive some extra stuff once I get back home. I truly enjoyed this summary. Job well done!